Now a Days there are many peoples are trying to analyze the Market Moves The Real Factor is 98% Of them Are not Reaching their Destiny, And First Of all Every One Should Know What Market is? And how it’s running! For the Help of Innocent Public here we are Sharing a Part of Knowledge to all, Hope It will Help Everyone. Go through the Article and Send your feedback to us. There are 2 types of analysis you can use to Study the Market. Fundamental analysis is a way of looking at the market through economic, social and political factors that affect supply and demand in goods/market. Now each country / Markets looking other countries /Markets Moving and its Status whether in uptrend or Down trend, and the news, Happenings, etc, Thus Trend almost 85% depends upon world market Moves. The idea behind this type of analysis is that if a country’s economy is doing well, their currency will also be doing well. This is because the better a country’s economy, the more trust other countries have in that currency. For Example: If the US country is heading towards A better way, Or the Economy Grows then the Dollar the US will also Move upward or Will Increase its Value. As the economy gets better, interest rates get higher, to control inflation and as a result, the value of the Dollar continues to increase. In briefly, this is basically what fundamental analysis is called! Technical analysis is the study of price movement. In one word, technical analysis can be found out with the help of charts. This is because the charts can provide the previous movements for us of a particular price movement of a stock, or it is called Historical data in paper, thus one can go through the Historical price movement or can analyze its character easily and can determine where the price will go further from there. By looking at charts, you can identify trends and patterns which will help us to find good trading opportunities in market. The most Important thing with technical analyze is to find out the trend of a stock and its support and resistance in the market. For that we need to study the charts, and what charts are? or How to find the trend ? etc, if a person can determine the trend of the market he can be a good trader, there is a Saying “TREND IS YOUR FRIEND” So try to make this Trend as your Best Friend. The reason for this is that you can make money when you can find a trend and trade according with the trend. 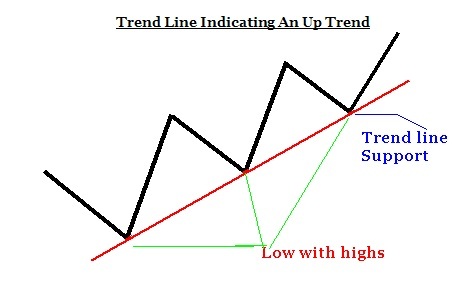 Technical analysis can help you identify these trends with the help of Technical tools /Indicators. A simple line chart draws a line from one closing price to the next closing price/as we wish (we can choose any price like closing, high, low etc). Each closing prices of a particular period can be taken and marked in the graph and by joins the points we will get the line charts. When strung together with a line, we can see the general price movement of a currency pair over a period of time. A bar chart also shows closing prices, while simultaneously showing opening prices, as well as the highs and lows. The bottom of the vertical bar indicates the lowest traded price for that time period, while the top of the bar indicates the highest price paid. So, the vertical bar indicates the Stocks pair’s trading range as a whole. The horizontal hash on the left side of the bar is the opening price, and the right-side horizontal hash is the closing price. In Bar Charts We can see all the Prices Like OPEN, HIGH, LOW, & CLOSE. These charts are also like Bar Charts, as it shows all the Prices Like OPEN, HIGH, LOW, & CLOSE. But difference is only in there appearance in their body shape. Candlestick bars indicate the high-to-low range with a vertical line. 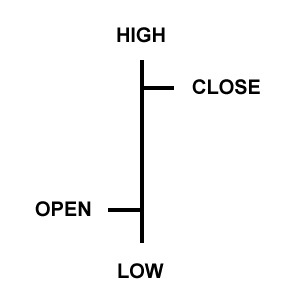 However, in candlestick charting, the larger block in the middle indicates the range between the opening and closing prices. If the block in the middle is filled or colored in, then the Price closed lower than it opened and Vice versa. Here You can see Two candles In it the First candle the box shows in white color or its not filled , and we can say this candle show the closing price of the stock is above its open price, Means it’s a bull dominated day for the stock, The top most part of the candle is the high price and the lower most part of the candle is the low price of that stock. As same the second candle show the box with black color filled, which means the price of the stock closed below its opening price of that day. High and Low will as same as the first candle. And we can say it’s a bear dominated day for he stock. Now lets we Move to Support and Resistance Levels. Support and resistance is one of the most widely used words and concepts in trading. Everyone seems to have their own idea on how to find support and resistance of the market/Stocks. 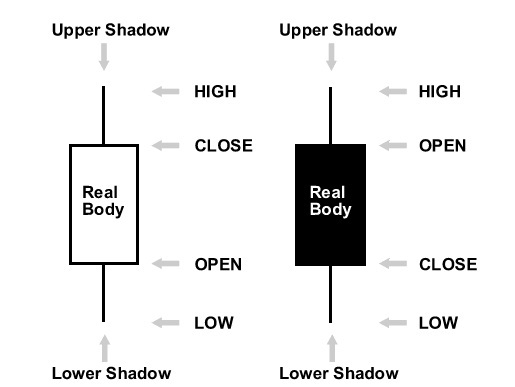 Support is the place where the price of the stock may bounce back to higher prices, in other words It’s the place where buying pressure may Take place and Resistance is the Place where the price of the stock may fall, in other words Its the place where selling pressure may occur, in general many of us used the technique method called “ Pivot Points”. 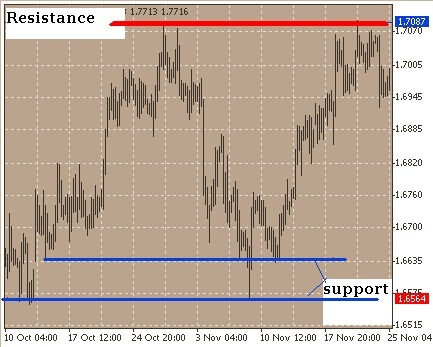 But using Charts its differs Here check out the Image Shows how the charts signs Supports and Resistance levels. In the above chart you can see red line in the down side there it shows a strong support for some time at 5.53, and just above that you can see a green line showing the resistance for the stock at 5.70, and after breaking the resistance it try to move up to make a up move but failed from the point of 5.82 level and again tried to test the level 5.53 and again bounced back and gone up to make a trade at 6.44 after that it again fallen to 6.1 level and it tested that for another 3 times too. So again its another support and Resistance made is 6.44 not maoved any further up.. In this Image the red line is the trend line and the green line points out the trend points in a raising trend line can be drawn by joining the lower points with higher lows. In this graph the second low is higher than the previous low. 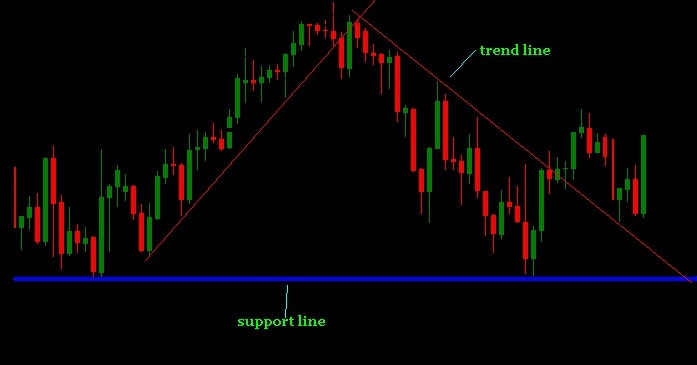 Here you can see the trend lines and support lines.